Romitaman Original Comic Book Art :: Private Collection :: Amazing Spider-Man 116 Cover SOLD SOLD SOLD! by artist John Romita Sr. 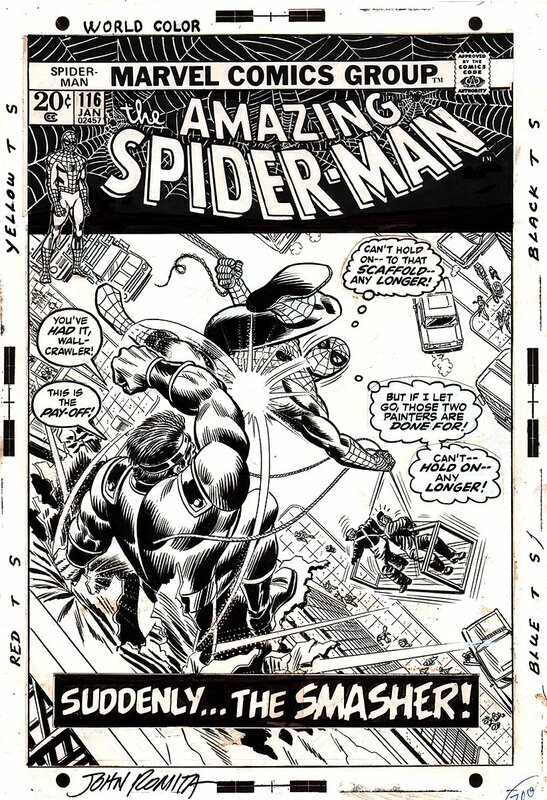 Check out this SWEET "AMAZING" Spider-Man all out battle cover from 1972 which was penciled AND INKED by the great JOHN ROMITA, has all of the elements that made THE AMAZING SPIDER-MAN comic book so...AMAZING! SPIDER-MAN was the GREATEST soap Opera EVER in comics! A CHARACTER page from one of Steve Ditko's or John Romita's Spidey books was as important to the story, and sometimes even MORE IMPORTANT than the action pages! NO WHERE ELSE in comic books was this more apparent than in AMAZING SPIDER-MAN! Stan Lee turned comics into REAL LIFE for us comic book fans, in these 1960's and 1970's AMAZING SPIDER-MAN COMICS! This GREAT John Romita cover, from the story titled: "Suddenly...The Smasher!" 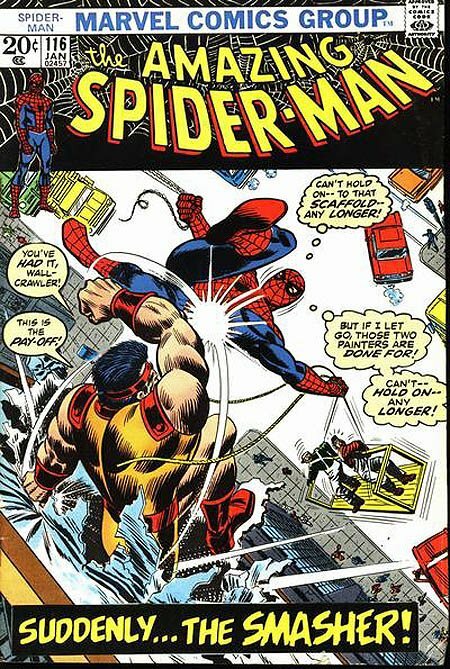 features Spiderman holding onto the building for dear life with 1 web line while using saving 2 men on a scaffold, as The evil "Smasher" punches Spidey! This scene is VERY reminiscent to the Green Goblin battle scene at the end of first Spiderman movie back in 2002! PLEASE click on the RED LINK ABOVE to Compare this "AMAZING" cover art to the published comic book above! ALL HIGH end pieces of art, including this one, are able to be purchased with VERY fair time payment plan options, and trades are always considered towards this and any other pieces of art on my site here! Just send me an email and we can try to work something out.